I had been wanting to try making arancini di riso for a while now. Arancini di riso are fried balls of rice. The balls of rice commonly contain things like ragu, mozzarella, peas, etc. You can make the rice from scratch for the arancini but it is a great way to breath some fresh life into your leftover risotto. Normally risotto disappears before I think about making arancini but this time I made sure to leave enough of the pea barley risotto to make the “rice” balls. I decided to keep it simple and just add a cube of mozzarella cheese since my risotto already had peas in it. I had some leftover marinara sauce in the freezer and I though that it would be a good idea to serve the rice balls on some of it. The rice balls are fairly easy to make. It is pretty much the same as any other breaded fried food; You dip the rice balls into the egg, then the bread crumbs, and then you fry them. I used the risotto directly from the fridge so it was cold, easy to work with and it held together. The arancini on marinara sauce were really tasty! They were nice and crispy on the outside and warm and gooey on the inside. Both the mozzarella and the parmigiano reggiano in the risotto had melted. Form the rice into balls and press the cheese into the middle. Roll the rice balls in the egg to coat. Roll the rice balls into a mixture of the the parmigiano reggiano and the bread crumbs to coat. Fry the rice balls in the oil until golden brown on all sides. I once worked for a wedding caterer and made probably 500 fontina-stuffed arancini in one afternoon. I declared loudly that I would never eat another arancino in my life. These look pretty damn tasty, though–I might make an exception. I especially like that they don’t look heavily breaded. As an Italian American, you get my stamp of approval! Next time try some prociutto in them. delish. I love love LOVE arancini and this looks incredibly good, Kevin. Wow. Drool. Balls of goodness?! I love breaded fried things. Unhealthy but delicious! Such an elegant, hearty dish! oh, these look wonderful. they are my husbands favorite and I would try your recipe for him, but I would hate to compete with his nonna. oh wow, that looks really good!! Fried rice balls, yes please. Baked or fried, the effort is worth the result. Another stunning dish. You can bet the next time I prepare risotto, I’ll make extra so I can make this. Truly, this looks delicious. Well done! Wow Kevin these look great. Clever use of leftovers. 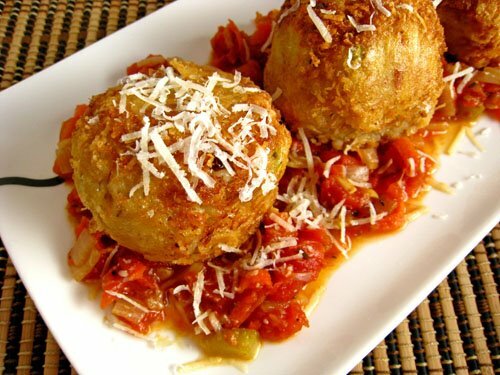 Your arancini look wonderful! You did a great job with them. Bravo! Kevin, wow, I can hardly keep up with you, one delicious dish after another! 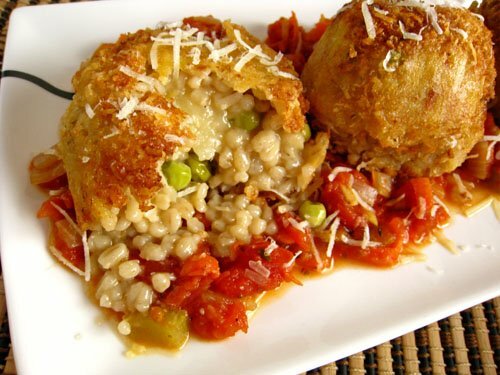 I can’t say I ever tried arancini with barley, but looking at the photo with the inside showing, makes me want to!! have a great day and I can’t wait for your next feast…. They look seriously good, Kevin. Now this looks amazing! I love how you incorporated leftovers. Those balls are so cute. Holy __!! That piece there that’s been cracked: wow. These look so good. Fabulous! I’m tempted to make risotto just so I can make these. Deep frying rice is a new one for me. I cook rice almost everyday so will try this out. I’ve bookmarked this to try, if I ever get round to cooking again! I’ve had a recipe for Aranchini on my impossibly long “to try” list since living with a Sicilian in 2001. Looks great! I never have enough leftover risotta to make arancini. Yours looks great! Beautiful pics of these intriguing rice balls. I’ve been wanting to try making these for a while too! They look delicious! Does everyone know about these except me?! I think they look reall deicious, I love the pic of the risotto oozing out. Do you deep or shallow fry them? I’ve always been curious about Arancini but figured they’d be too much work. You make it sound very do-able, and super yummy. My five year old is going to love this. And my husband. In fact, I think it’ll get pretty dirty over dinner when I make this. This is something that’s been on my to-try list. Love that second photo! I love arancini but have not attempted to make it before. I think I am going togive it a try. Wonderful blog with great photos. Delicious. Just imagine biting to it and then getting the creamy taste of that delicious filling. Just pure heaven. You are a wonderful cook, the other day i was going through you older post and my you have cooked so much varety of food. One of my favorite treats! Do you deliver? I don’t think I’ve ever heard of this before. What a great idea! I’ve never seen something like that – looks absolutely fantastic! Would love to try some of that! Kevin- I have seen this before but forgot about them. Fabulous looking and this will be on my must have list. There is a wonderful little Italian place by me that makes the most delicious rice balls. I’ve never thought to make them myself but this post is certainly inspiring. These look divine. What good timing! I have some risotto that will surely turn into leftovers. Rice balls it is! 🙂 These look great. Wow these look so good! I’ve wanted to make fried risotto balls but couldn’t quite bring myself to using all that oil! I made these tonight and they turned out pretty good! I might have made my balls too large as the cheese in the centre didn’t melt, but a quick zap in the microwave did the trick. but I think if you add some fried chiken in the middle it'll be awful! & hope you'll get successful!